Is this above mentioned sentence written or assumption? Derived from the meaning of the word sijjil. Taken from Bayyinah Tafsir. Besides, if Allaah hasn’t written which stone will hit who, it wouldn’t randomly hit someone by its own will. Stones have no will of their own. Universe does not have a will of its own. Nothing in the universe ever happens without Allaah’s decree. আমার মাথায় একটা প্রশ্ন ঘুরছে যে …নবীজী(সা.) তো দেখেন নি ওই ঘটনা, তাহলে আল্লাহ(সু. 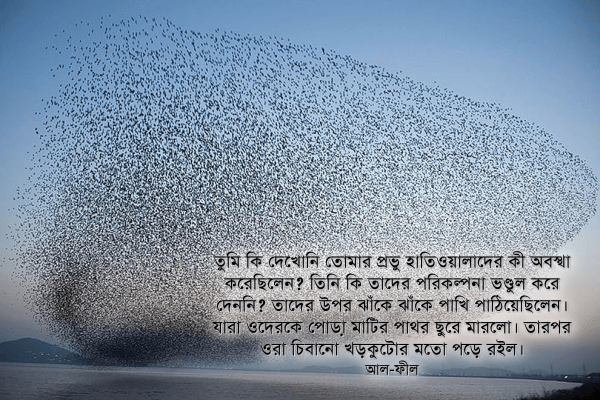 )…”তুমি কি দেখনি..” এই কথা বললেন কেন!? মানে নবীজী (স.) কে কি দেখানো হয়েছিল ঘটনা টা!?? ?